This entire story started on the 30th January 2012 episode of RAW. The Phenom shocked the world with a surprise return to the show and issued a challenge to HHH for a WrestleMania rematch. HHH refused the challenge the next week on RAW. HHH’s best friend Shawn Michaels showed up on the Feb 13th episode of RAW and confronted HHH about the challenge and its consequences. HHH claims that he did not want to end the 19-0 streak of the Phenom. The following week on the RAW, the Phenom confronted HHH again. Taker claims to end the uncertainty resulted after the WM 27 match. He said that he was going through a ‘Hell of Uncertainty’ over the past one year and a rematch would clear that uncertain feeling once and for all. He labelled HHH a coward and compared HHH’s ranks with Shawn Michaels. Taker said that, Shawn was a better wrestler than HHH and if Shawn couldn’t do it then HHH can’t do it. All these witty remarks made ‘The Game’ irate and he finally accepted the challenge calling it an ‘End of an Era’ match and adding the stipulation that the match would be a ‘Hell in a Cell’ match. Shawn Michaels was made the special guest referee for this match and the stage had been set up. The duel between this duo at WM 28 was a gruelling 50 minute encounter where chairs, stairs, sledge hammers and the steel cell were all used to full advantage. Undertaker was dominant throughout the match and HHH gave a tough fight. 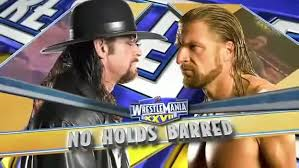 Taker locked the Hell’s gate submission hold thrice in the match and HHH successfully broke the hold, not wanting to submit as he did at WM 27. Undertaker used all his signature moves on HHH in the first half of the match but HHH was resilient and never yielded to the Phenom. ‘The Game’ bounced back into the game by delivering a spine buster on the steel stairs and following it up with a few shots with the sledge hammer. HHH attempted to break the skull of the Phenom but Shawn Michaels’ repeated intrusions prevented that from happening. Michaels was forced by HHH to call off the game and ring the bell but he refused to do so. Shawn was portrayed as a man going through intense mental agony and indecisive throughout the match. Michaels was locked in the Hell’s gate once in the match. Shawn delivered sweet chin music to the Phenom and HHH followed it up with a Pedigree. Undertaker kicked out of this vicious combo and came back strongly and delivered a Tombstone pile driver to HHH. ‘The Game’ managed to save his game by kicking out at 2 and later mocked the Undertaker and gave him a taste of his own medicine. Taker survived this and delivered one final Tombstone and won the match emphatically and went 20-0. After Undertaker went 20-0 by winning against HHH he made an appearance on the 1000th episode of RAW on 23rd July 2013. He helped his brother Kane that night and never showed up again in 2012. As was always the case with the Phenom, he showed up again in 2013 looking for a new opponent for WM 29. This time it was CM Punk and Taker won the match 21-0. Later on in 2014, Undertaker accepted the challenge of Brock Lesnar and lost his streak and went 21-1 to Lesnar. There is no official declaration of Undertaker’s match at WrestleMania 31 till now. HHH on the other hand was involved in his duty as the COO of WWE. He was on the administration line from then on and was involved in a few brawls with Brock Lesnar in 2012-13. He defeated Lesnar in WM 29. After WM 29 HHH is totally concentrating on running the business and trying to deliver what’s best for business. He fought with Bryan in WM 30 after a long time but lost the match. As of now, all indications towards HHH taking on Sting at WM 31.